11/5 check out the sweet potatoes! So I caved and bought a 10# bag of ugly sweet potatoes. 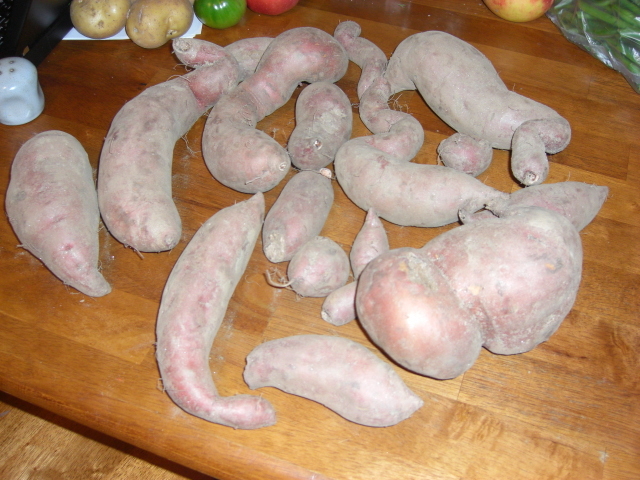 I’ve been so pleased with the CSA sweet potatoes; they’re like what grocery store sweet potatoes wish they could be. Here are my uglies. Here’s what I think was the premium stuff. I’m not sure, though; the eggs could have been regular. The basil’s already pesto and safely ensconced in the freezer. I’m going to take the plunge and fry the green tomatoes. My husband said something about buttermilk wash being important, so I’ll look around and see what recipes I can find. One of the apples has already been cut up and eaten, the second soon to follow. The two sweet potatoes will probably be lunch today along with a salad. The little ugly sweet potatoes will get roasted and eaten this weekend. The bigger ones we’ll just store and eat later. I’ll probably roast the turnips, too. My neighbor Lucy has suggested this briami recipe. Maybe I’ll try it with the turnips and little sweet potatoes. I want to save the white potatoes for eating baked because we just love them that way. 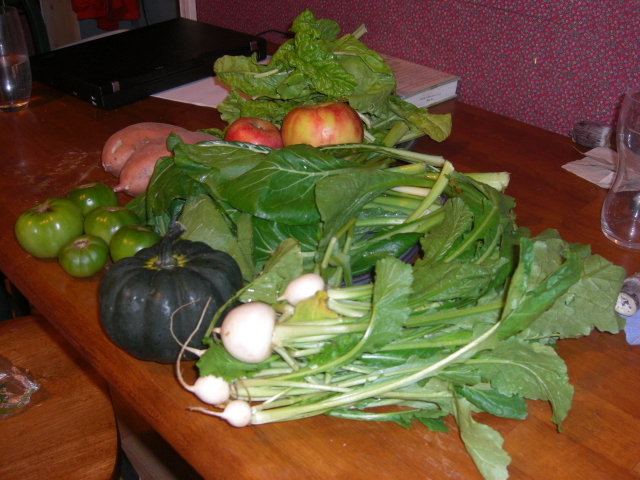 Then again, our weekly CSA flyer suggests slicing these milder turnips into salads. So I’ll try that. Maybe we’ll come to enjoy the turnips as much as the radishes. The smaller chard and komatsuma greens will be added to last week’s lettuce to stretch the salads. I’m not sure what to do yet with the rest of the greens. As I’ve said before, we not a big greens family. But, when looking at the Komatsuma, even I can tell them’s some purty greens. So I’m a little hesitant to condemn them to obscurity in creamy alfredo or dip. They taste kind of like cabbage to me – maybe I’ll try a little stir-fry. Hmm. 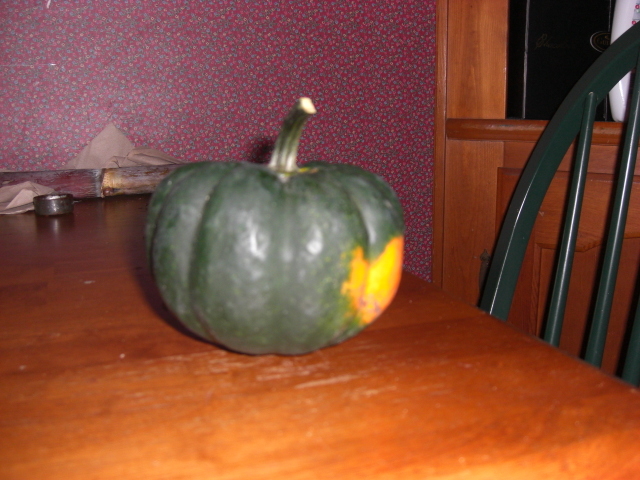 And the little acorn squash – too cute to cook? Probably not, in the end. But it should last for a while. So we’ll enjoy its outsides now and its insides later. 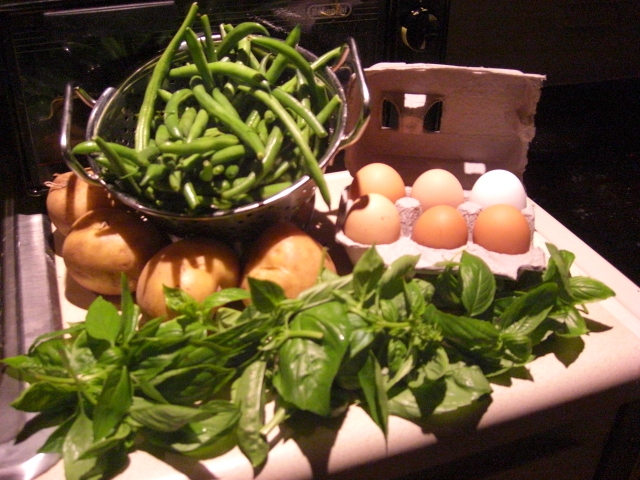 Here’s a great recipe for those greens. You can use any greens or beans or pasta for that matter and we sometimes add sausage. Hope you enjoy. 2) Prepare the kale by ripping it off its stems. Tear the leaves into bite-size pieces. You should have about 12 cups. Rinse by immersing in a large boil of cold water. Remove and drain in a colander. 3) Heat the oil in a large skillet over medium-high heat. Add the garlic and red pepper flakes and saute for 2 minutes. Stir in the kale and vegetable stock and cover the pan. Cook until wilted and tender yet still bright green, about 7 minutes. Gently stir in the beans and salt and keep warm over low heat. 4) Drop the penne into the boiling water and cook until tender yet chewy, about 10 minutes. Drain thoroughly, the carefully stir it into the kale mixture along with the Parmesan cheese. Serve immediately. *I have used chicken stock and veggie stock, and they each gave a different flavor (I loved them both). I’ve also used a 6 Italian cheese mix before instead of Parmesan (which I did not have) and it tasted really good too. If you want it to be a little spicier it tastes really good with a little more crushed red pepper. I like with just a little more salt and fresh ground pepper on top. This sounds great, Allison. I’ll try this with my greens this week or next.